San Antonio is a blend of old and new. In the heart of downtown sits the Alamo, flanked in the near distance by high-rise hotels. But the modern feel really comes to play at the River Walk, which takes you beneath street level and along the flood protection bypass for the San Antonio River. While the River Walk itself is not new (the Channel Improvement Project was authorized by Congress in 1954 and was followed by a beautification project in 1970) the high volume of bars, restaurants, merchandise stalls and people – against the backdrop of what is essentially a canal – make it seem like a cross between Vegas’ Venetian and Venice itself. Obviously this is a no-brainer. There is a reason why The Alamo is visited by 2.5 million tourists each year. While The Alamo is best known for the 13-day Texan stand against the army of General Antonio Lopez de Santa Anna, inside and beyond the famous church (through which you enter The Alamo) you will also find lots of information about the rest of its 300 year history. Best of all it is free – although a donation to the Daughters of the Republic of Texas, who maintain the old mission and its grounds, is encouraged. There are tons of restaurants in San Antonio – featuring everything from Texas Barbeque to comfort food, to steak dinners. However if you are short on time, why not get a reservation at the Chart House, located at the top of the historic Tower of the Americas. Not only is the food amazing but the rotating view of San Antonio is breathtaking. 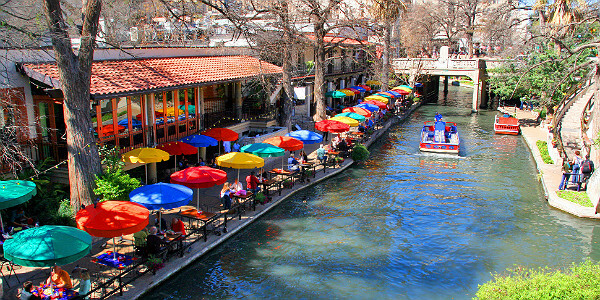 If people watching is your thing, then head down to the River Walk and park yourself at one of the many bars and restaurants that line the walkway. I can personally recommend the The Worm bar, whose patio has a welcomed barrier between you and the pedestrians – not to mention great live music and margaritas to die for. Based on the service of the front desk alone, I would recommend the Grand Hyatt San Antonio. However there are many hotels that are situated near to the downtown action. Just make sure to pick a new hotel or one that has been renovated because some hotels, like the Marriott River Walk, still have single pane windows and have to offer complimentary ear plugs to help mask the noise from the street. The summer months can be hot, hot, hot – not to mention rather crowded. With that in mind, consider visiting San Antonio in the fall or spring. The weather is normally extremely comfortable (mid 70’s in October) and schools will be back in session. How To Get There: San Antonio International Airport (SAT) is approximately eight miles from downtown, and is serviced by 16 domestic and international airlines. Best Time To Visit: As stated above, the summer can be quite hot. Consider visiting San Antonio in the fall or spring.